Minimizing cluster size of water molecules:: Water molecules are unique due to the fact that one side of the molecule is positive charged and the opposite side is negative charged, therefore water molecules have a tendency to cluster like grapes on a vine. If the size of cluster is smaller, it means better performance on infiltrating into and detoxifying out of cells. Life Ionizers reduce the cluster size using the most advanced technology. Anti-oxidant levels up to -851mV: The core part of the Life Ionizer is its patented electrolysis chamber. 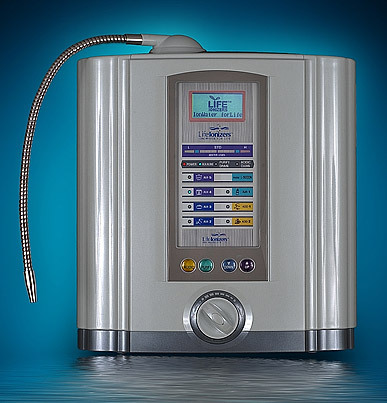 Life Ionizers succeeded in not only minimizing the cluster size of water to 50Hz but also in achieving high anti-oxidant power of -200 and up to -851mV depending on water quality. Reaching this level of ionization is accomplished by using our latest technological advancements and is dependent on your source water - if you have an acidic water to begin with and a high positive ORP, this will change your results. Specially devised, high quality 6 Stage filter: Life Ionizers have the most comprehensive pre-filters available on the market today. Each unit has two built in filters totaling 12 stages of filtration/treatment. High Quality Construction: The highest quality component parts available are used on the LI 5000 from the sturdy alkaline-water connector on the top of the ionizer down to the custom stainless steel fittings on the bottom.